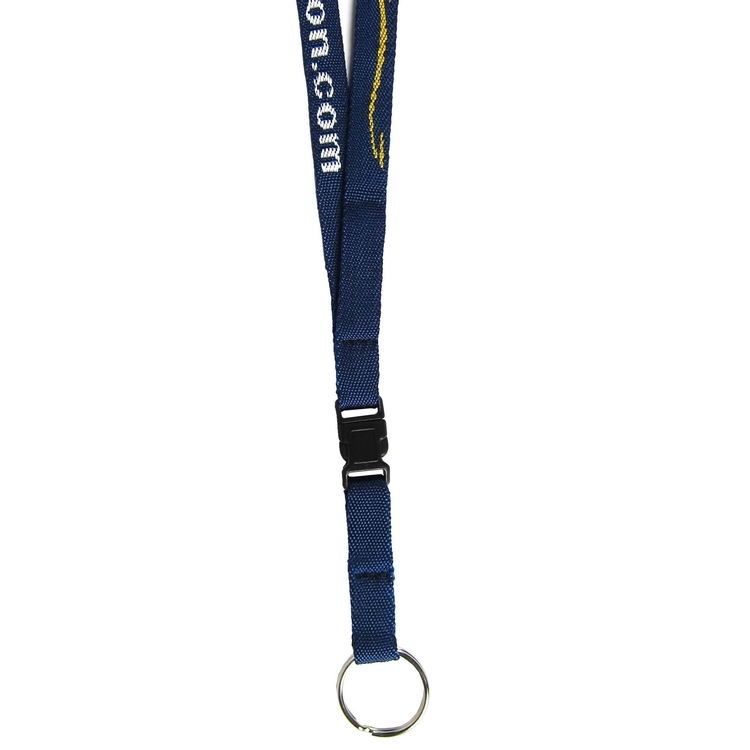 Platinum includes 1- or 2-color imprint on 1-color webbing (1- or 2-sided if available). Layout: Sewn with a twist in the webbing to lay flat when worn. Imprint reads up on right and down on left (when viewing being worn). 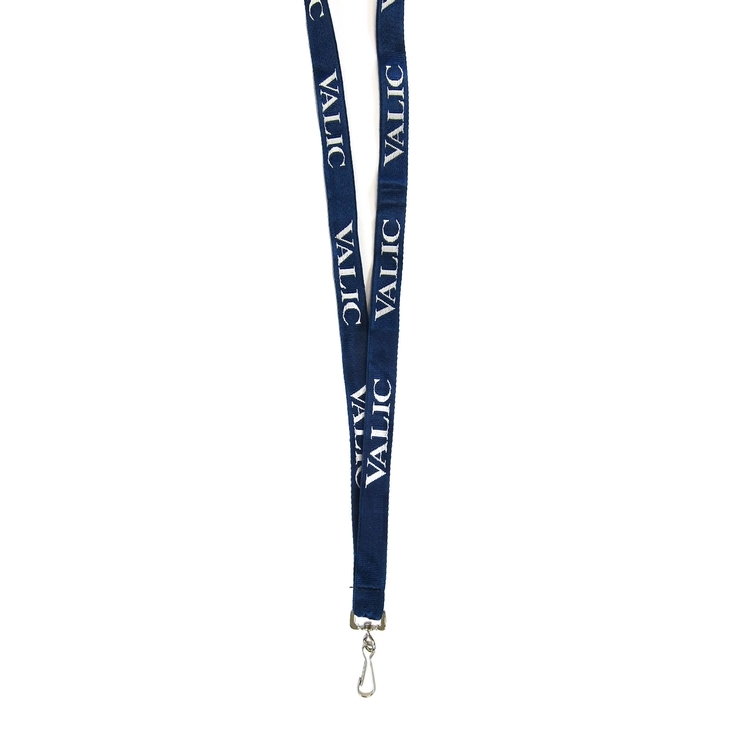 Size: 1/2" x 17-1/2" (+/- 5%) Hardware included: * Large or Small Split Ring or * Swivel Snap Other Lanyard Hardware Options: * Swivel Snap & Large Split Ring * Swivel Bulldog Clip * Back Breakaway Item/Imprint Colors: See images for colors. Set-up: Logo, special font or specific layout requests $45(G). No charge for straight line copy in our house font (block-style font similar to Arial / Helvetica). PMS® Color Match: Not Available. Layout Proof: Free upon request with order. Will affect production time. Please allow two business days if proof requested. Pre-Production Proof: $45(G) per proof (includes overnight shipping). Required on orders over 2500 pieces. Will affect production time. Spec Sample: Random colors FREE. Specific color combinations $45(G). Please allow 8-10 day production. All design charges apply. Packaging: Bulk. F.O.B. : Wisconsin (53037) Overruns/Underruns: +/- 5% is normal and will be billed accordingly. Production Time: Product is MADE IN THE USA when capacity permits. Production time may be less than or more than 60 days. Time will depend on actual quantity order. Please contact Customer Service to quote production time for your order. Select webbing includes 1-color imprint on 1-color webbing. Layout: Sewn with a twist in the webbing to lay flat when worn. Imprint reads up on right and down on left (when viewing being worn). 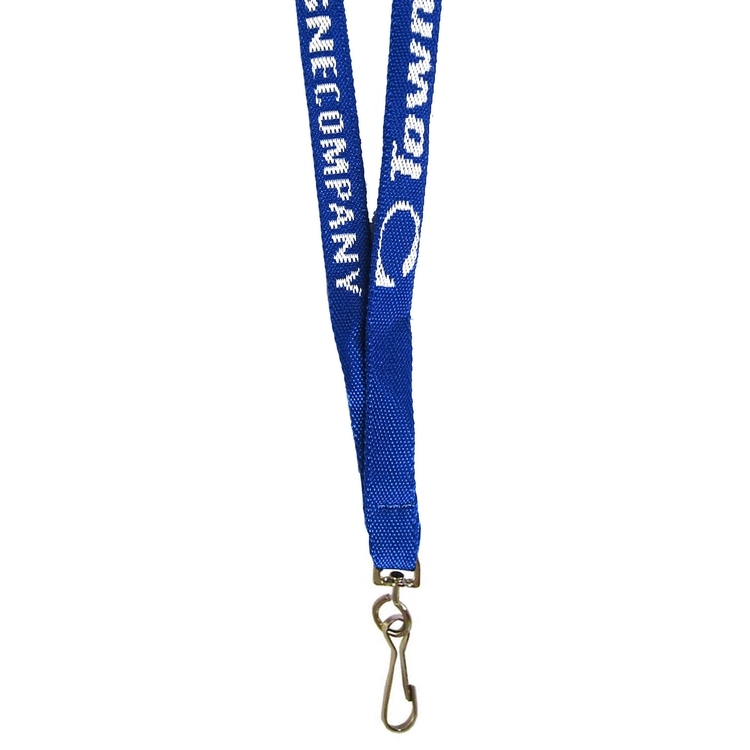 Hardware included: * Large or Small Split Ring or * Swivel Snap Other Lanyard Options: * Swivel Snap & Large Split Ring * Swivel Bulldog Clip * Back Breakaway Size: 1/2" x 17-1/2" (+/- 5%) Item/Imprint Colors: See images for colors. PMS® Color Match: Not Available. Set-up: Logo, special font or specific layout requests $45(G). No charge for straight line copy in our house font (block-style font similar to Arial / Helvetica). PMS® Color Match: Not Available. Layout Proof: Free upon request with order. Will affect production time. Please allow two business days if proof requested. Pre-Production Proof: $45(G) per proof (includes overnight shipping). Required on orders over 2500 pieces. Will affect production time. Spec Sample: Random colors FREE. Specific color combinations $45(G). Please allow 8-10 day production. All design charges apply. Packaging: Bulk. F.O.B. : Wisconsin (53037) Overruns/Underruns: +/- 5% is normal and will be billed accordingly. Production Time: Product is MADE IN THE USA when capacity permits. Production time may be less than or more than 60 days. Time will depend on actual quantity order. Please contact Customer Service to quote production time for your order. Classic includes 1-color woven imprint on 1-color webbing. Sewn with a twist in the webbing to lay flat when worn. Imprint reads up on right and down on left (when viewing being worn). Size: 1/2" x 22-1/2" on each side (+/-5%). Item/Imprint Colors: See images for colors. PMS® Color Match: Not Available. Set-up: Logo, special font or specific layout requests $45(G). No charge for straight line copy in our house font (block-style font similar to Arial / Helvetica). Virtual/Layout Proof: Free upon request with order. Will affect production time. Please allow two business days if proof requested. Pre-Production Proof: $45(G) per proof upon request with order (includes overnight shipping). Will affect production time. Spec Sample: Random colors FREE. Specific color combinations $45(G). Please allow 8-10 day production. All design charges apply. Packaging: Bulk. F.O.B. : Wisconsin (53037) Overruns/Underruns: +/- 5% is normal and will be billed accordingly. Production Time: 6 working days after requested proof approval. Select webbing includes 1-color imprint on 1-color webbing. Size: 1/2" W x 17.5" L (+/- 5% each side). Item/Imprint Colors: See images for colors. PMS® Color Match: Not Available. Hardware included: * Large or Small Split Ring or * Swivel Snap Other Lanyard Hardware Options: * Swivel Snap & Large Split Ring * Swivel Bulldog Clip * Back Breakaway Set-up: Logo, special font or specific layout requests $45(G). No charge for straight line copy in our house font (block-style font similar to Arial / Helvetica). Layout Proof: Free upon request with order. Will affect production time. Please allow two business days if proof requested. Pre-Production Proof: $45(G) per proof upon request with order (includes overnight shipping). Will affect production time. Spec Sample: Random colors FREE. Specific color combinations $45(G). Please allow 8-10 day production. All design charges apply. Packaging: Bulk. F.O.B. : Wisconsin (53037) Overruns/Underruns: +/- 5% is normal and will be billed accordingly. Select webbing includes 1-color imprint on 1-color webbing. Layout: Sewn with a twist in the webbing to lay flat when worn. Imprint reads up on right and down on left (when viewing being worn). 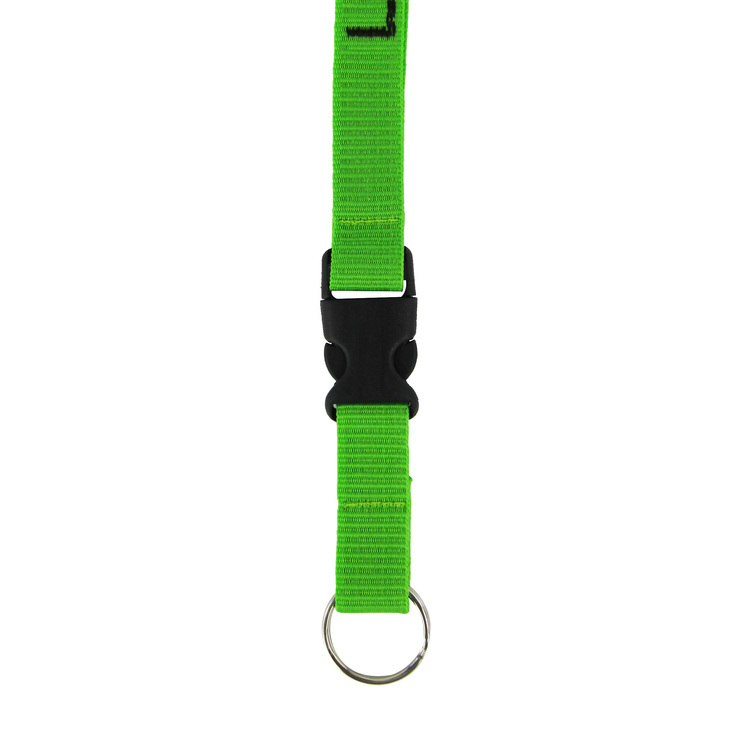 Hardware included: * Large or Small Split Ring or * Swivel Snap Other Lanyard Hardware Options: * Swivel Snap & Large Split Ring * Swivel Bulldog Clip * Back Breakaway Size: 1/2" x 22-1/2" on each side (+/-5%). Item/Imprint Colors: See images for colors. PMS® Color Match: Not Available. Set-up: Logo, special font or specific layout requests $45(G). No charge for straight line copy in our house font (block-style font similar to Arial / Helvetica). Layout Proof: Free upon request with order. Will affect production time. Please allow two business days if proof requested. Pre-Production Proof: $45(G) per proof (includes overnight shipping). Required on orders over 2500 pieces. Will affect production time. Spec Sample: Random colors FREE. Specific color combinations $45(G). Please allow 8-10 day production. All design charges apply. Packaging: Bulk. F.O.B. : Wisconsin (53037) Overruns/Underruns: +/- 5% is normal and will be billed accordingly. Production Time: Product is MADE IN THE USA when capacity permits. Production time may be less than or more than 60 days. Time will depend on actual quantity order. Please contact Customer Service to quote production time for your order. Select webbing includes 1-color imprint on 1-color webbing. Size: 1/2" W x 22-1/2" L. Item/Imprint Colors: See images for colors. PMS® Color Match: Not Available. Hardware included: * Large or Small Split Ring or * Swivel Snap Other Lanyard Hardware Options: * Swivel Snap & Large Split Ring * Swivel Bulldog Clip * Back Breakaway Set-up: Logo, special font or specific layout requests $45(G). No charge for straight line copy in our house font (block-style font similar to Arial / Helvetica). Layout Proof: Free upon request with order. Will affect production time. Please allow two business days if proof requested. Pre-Production Proof: $45(G) per proof upon request with order (includes overnight shipping). Will affect production time. Spec Sample: Random colors FREE. Specific color combinations $45(G). Please allow 8-10 day production. All design charges apply. Packaging: Bulk. F.O.B. : Wisconsin (53037) Overruns/Underruns: +/- 5% is normal and will be billed accordingly. Classic webbing includes 1-color imprint on 1-color webbing. Layout: Sewn with a twist in the webbing to lay flat when worn. Imprint reads up on right and down on left (when viewing being worn). Standard Length: 1/2" W x 17.5" L on each side (+/-5%). 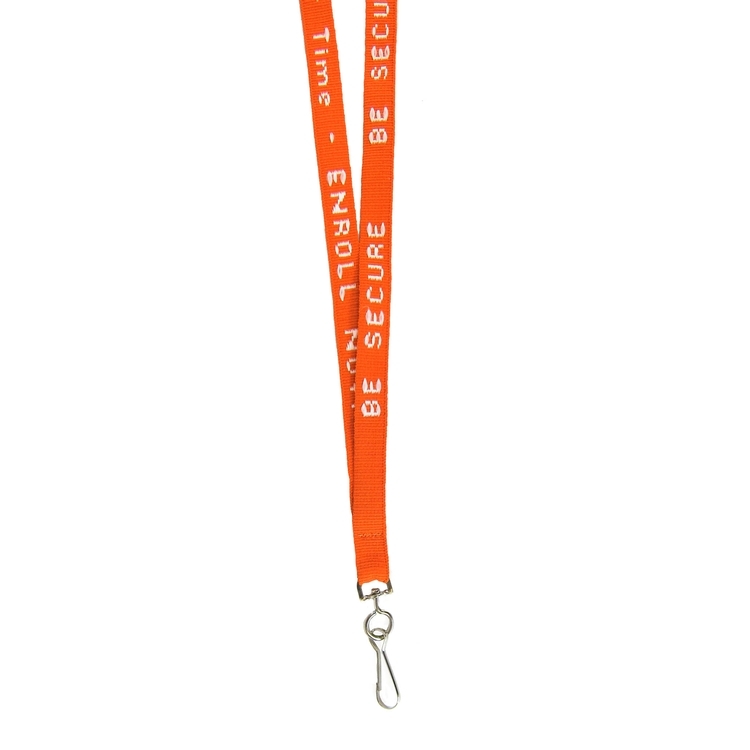 Hardware included: * Large or Small Split Ring or * Swivel Snap Other Lanyard Options: * Swivel Snap & Large Split Ring * Swivel Bulldog Clip * Back Breakaway Product/Imprint Colors: See color chart in product images. PMS® Color Match: Not Available. Set-up: Logo, special font or specific layout requests $45(G). No charge for straight line copy in our house font (block-style font similar to Arial / Helvetica). Layout Proof: Free upon request with order. Will affect production time. Please allow two business days if proof requested. Pre-Production Proof: $45(G) per proof upon request with order (includes overnight shipping). Will affect production time. Spec Sample: Random colors FREE. Specific color combinations $45(G). Please allow 8-10 day production. All design charges apply. Packaging: Bulk. F.O.B. : Wisconsin (53037) Overruns/Underruns: +/- 5% is normal and will be billed accordingly. Classic includes 1-color imprint on 1-color webbing. Sewn with a twist in the webbing to lay flat when worn. Imprint reads up on right and down on left (when viewing being worn). Size: 1/2" x 22-1/2" on each side (+/-5%). Item/Imprint Colors: See images for colors. PMS® Color Match: Not Available. Set-up: Logo, special font or specific layout requests $45(G). No charge for straight line copy in our house font (block-style font similar to Arial / Helvetica). Layout Proof: Free upon request with order. Will affect production time. Please allow two business days if proof requested. Pre-Production Proof: $45(G) per proof (includes overnight shipping). Required on orders over 2500 pieces. Will affect production time. Spec Sample: Random colors FREE. Specific color combinations $45(G). Please allow 8-10 day production. All design charges apply. Packaging: Bulk. F.O.B. : Wisconsin (53037) Overruns/Underruns: +/- 5% is normal and will be billed accordingly. Production Time: Product is MADE IN THE USA when capacity permits. Production time may be less than or more than 60 days. Time will depend on actual quantity order. Please contact Customer Service to quote production time for your order. Classic webbing includes 1-color imprint on 1-color webbing. Layout: Sewn with a twist in the webbing to lay flat when worn. Imprint reads up on right and down on left (when viewing being worn). 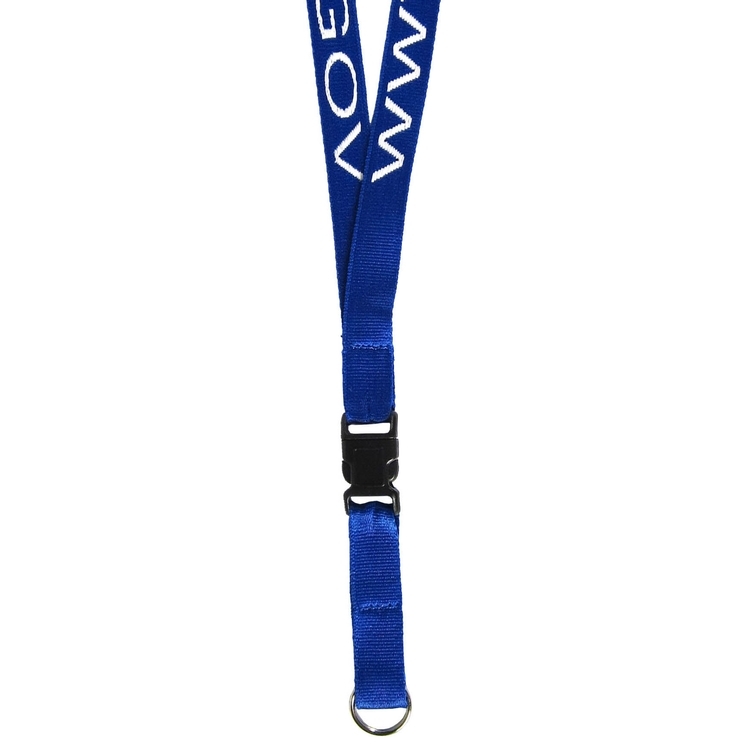 Hardware included: * Large or Small Split Ring or * Swivel Snap Other Lanyard Hardware Options: * Swivel Snap & Large Split Ring * Swivel Bulldog Clip * Back Breakaway Size: 1/2" x 17" on each side (+/-5%). Item/Imprint Colors: See images for colors. PMS® Color Match: Not Available. Set-up: Logo, special font or specific layout requests $45(G). No charge for straight line copy in our house font (block-style font similar to Arial / Helvetica). Layout Proof: Free upon request with order. Will affect production time. Please allow two business days if proof requested. Pre-Production Proof: $45(G) per proof (includes overnight shipping). Required on orders over 2500 pieces. Will affect production time. Spec Sample: Random colors FREE. Specific color combinations $45(G). Please allow 8-10 day production. All design charges apply. Packaging: Bulk. F.O.B. : Wisconsin (53037) Overruns/Underruns: +/- 5% is normal and will be billed accordingly. Production Time: Product is MADE IN THE USA when capacity permits. Production time may be less than or more than 60 days. Time will depend on actual quantity order. Please contact Customer Service to quote production time for your order. Platinum webbing includes 1- or 2-color imprint on 1-color webbing (1- or 2-sided if available). Sewn with a twist in the webbing to lay flat when worn. Imprint reads up on right and down on left (when viewing being worn). Size: 1/2" W x 22-1/2" L on each side (+/-5%). Item/Imprint Colors: See images for colors. PMS® Color Match: Not Available. Set-up: Logo, special font or specific layout requests $45(G). No charge for straight line copy in our house font (block-style font similar to Arial / Helvetica). Layout Proof: Free upon request with order. Will affect production time. Please allow two business days if proof requested. Pre-Production Proof: $45(G) per proof upon request with order (includes overnight shipping). Will affect production time. Spec Sample: Random colors FREE. Specific color combinations $45(G). Please allow 8-10 day production. All design charges apply. Packaging: Bulk. F.O.B. : Wisconsin (53037) Overruns/Underruns: +/- 5% is normal and will be billed accordingly. Platinum includes 1- or 2-color imprint on 1-color webbing (1- or 2-sided if available).Sewn with a twist in the webbing to lay flat when worn. Imprint reads up on right and down on left (when viewing being worn). Size: 1/2" x 22-1/2" on each side (+/-5%). Item/Imprint Colors: See images for colors. PMS® Color Match: Not Available. Set-up: Logo, special font or specific layout requests $45(G). No charge for straight line copy in our house font (block-style font similar to Arial / Helvetica). Layout Proof: Free upon request with order. Will affect production time. Please allow two business days if proof requested. Pre-Production Proof: $45(G) per proof (includes overnight shipping). Required on orders over 2500 pieces. Will affect production time. Spec Sample: Random colors FREE. Specific color combinations $45(G). Please allow 8-10 day production. All design charges apply. Packaging: Bulk. F.O.B. : Wisconsin (53037) Overruns/Underruns: +/- 5% is normal and will be billed accordingly. Production Time: Product is MADE IN THE USA when capacity permits. Production time may be less than or more than 60 days. Time will depend on actual quantity order. Please contact Customer Service to quote production time for your order. Platinum includes 1- or 2-color imprint on 1-color webbing (1- or 2-sided if available). Item/Imprint Colors: See images for colors. PMS® Color Match: Not Available. Hardware included: * Large or Small Split Ring or * Swivel Snap Other Lanyard Hardware Options: * Swivel Snap & Large Split Ring * Swivel Bulldog Clip * Back Breakaway Set-up: Logo, special font or specific layout requests $45(G). No charge for straight line copy in our house font (block-style font similar to Arial / Helvetica). Layout Proof: Free upon request with order. Will affect production time. Please allow two business days if proof requested. Pre-Production Proof: $45(G) per proof upon request with order (includes overnight shipping). Will affect production time. Spec Sample: Random colors FREE. Specific color combinations $45(G). Please allow 8-10 day production. All design charges apply. Packaging: Bulk. F.O.B. : Wisconsin (53037) Overruns/Underruns: +/- 5% is normal and will be billed accordingly.